Hamburger seasoning come in all shapes and sizes and many are just perfect for enhancing the flavor of ground beef. Here are some of my tips for bringing out the very best in your ingredients. Let's talk about the basics first. Salt and pepper. It used to be said that adding salt to meat before you cook would draw out the moisture and leave you with a dry burger. Fortunately, this is a old wives' tale. Pepper should be freshly cracked. Pre-grounded pepper loses the heady aroma so distinctive of peppercorns. Black or white pepper. Take your pick. It is always good to master the basics. You don't have to try too hard when it comes to seasoning. If you really can't think of anything else. Salt and pepper then. It is equally good. Venture a little more and try some of these gourmet seasonings & spices from CyberCucina. Try their Espelette pepper powder and get transported to the Basque country. Mix a little into the ground beef. How about adding a roasted garlic juice? Lavendar salt? Sofrito is a Spanish term for a cooked, aromatic sauce made up of olive oil, minced garlic, onions and tomatoes. Green peppers and chopped mushrooms can also be added. Heat a couple of tablespoons of olive oil on medium-high for about 5 minutes. Then, add the onions. When they start to become translucent, add everything else EXCEPT the garlic. Cook the entire mixture at this point until the onions start to caramelize. Then, add the minced garlic and mix it all up. Wait one minute. Add the entire mixture to your ground beef along with other binding agents like bread crumbs or an egg. 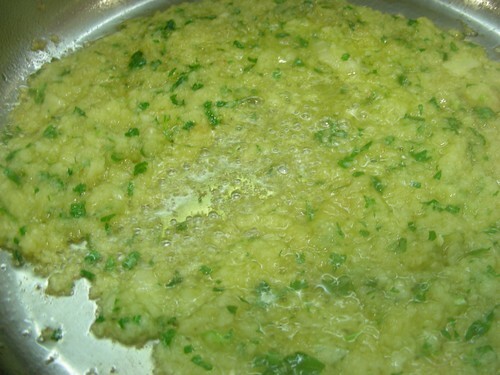 This Sofrito mixture will add a ton of flavor to your burger! For best results, add a pinch of cayenne pepper and top the burger with pepper-jack cheese. Mmmmmm!